MultiPastel Chalk Pencils have a smooth, blendable formula for use in traditional fine arts, scrapbooks or memory books. They're perfect for lettering, outlining, stripes, borders, shading, accents, embellishments, roughing and aging effects. 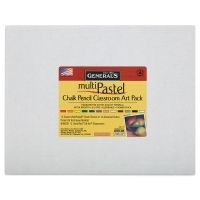 This economical classpack includes 12 of each of the following Pastel Chalk pencil colors: Black, Canary Yellow, Green, Indigo Blue, Light Fresh, Light Gray, Orange, Pink, Scarlet Red, Van Dyke Brown, Violet, and White. It also includes 12 Portrait Lesson booklets, 12 Pastel Chalk Pencil technique booklets, and 12 All-Art sharpeners. Colors may vary. 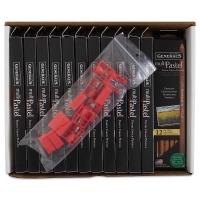 ® General's is a registered trademark of the General Pencil Company.® MultiPastel is a registered trademark.